The Linksys X-series Gateways have two (2) modes of operation: modem-router and router only. Setting up a Linksys X-series Gateway as a modem-router allows the device to work as a DSL modem and a router at the same time. This article will guide you on how to set up the device as a modem-router using the Setup Wizard. Don’t have the Setup CD? Click here. Insert the Setup CD into the CD or DVD drive of your computer. Click Set up your Linksys Router. If you do not see the Autoplay window, click Start > Computer. Double-click the CD drive (in this case, drive E) then the setup icon. 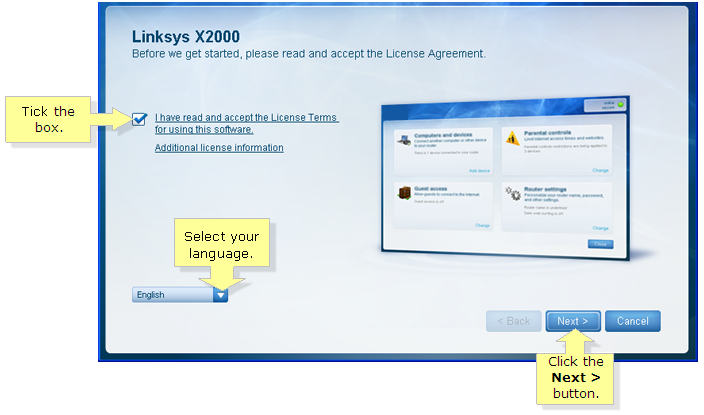 Read the License Agreement then check the box next to it to agree. Click the Next > button. NOTE: Select your preferred language from the language drop-down menu. Click Modem-router at the How will you be using your X2000 screen then click the Next > button. Connect the power cable. If your router has a Power button, turn it ON, then click on the Next > button. Plug one end of the first Ethernet cable to the modem-router’s DSL port (for DSL users) or Cable port (for Cable Internet) and connect the other end to the telephone jack on your wall. 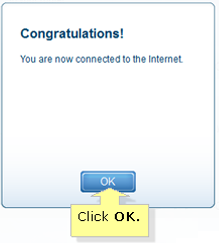 IMPORTANT: For DSL connection, you will be asked to enter your ISP information. Select your region, ISP, and the DSL settings your ISP has provided. For Linksys X1000 and X3500, you have the option to skip the setup software detection feature by ticking the My region is not in this list checkbox, and clicking Next. Once done, you can complete the rest of the information by entering the requested details for DSL Settings, Internet Type, and Account Information provided by your ISP. Connect one end of the second Ethernet cable to the yellow port at the back of the X-series Gateway and then connect the other end to your computer. Click the Next > button. Change the Router name (SSID) and Password and then click the Next > button. NOTE: Take note of the Router name (SSID) and the Password. You will need these when you connect additional wireless devices to the network. Once the prompt below appears, click OK. Your Linksys X-series Gateway should now be successfully set up.